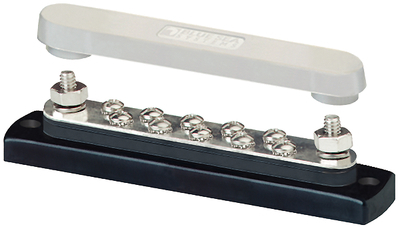 Industry standard BusBar features tin-plated copper bus, 1/4" stainless steel studs and 8-32 terminal screws. Continuous rating 150 AMPS AC/DC, maximum voltage 300 volts AC, 48 Volts DC. 1/4"-20 stud, #8-32 terminal screw.